The entire southeastern quadrant of Jerseyville consisted of a series of open ditches and filled-in ditches, under-sized roadway and driveway culverts (and no culverts in some areas), and other low-lying areas in a very flat section of the City that was in desperate need of drainage improvements. The drainage area consisted of over 160 acres, mostly single family residential in nature, with some apartments as well. 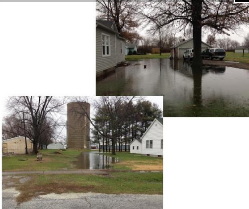 Heavy rain events have caused significant ponding on both private property and public right-of-way, overflowing ditches, overtopping of street curbs, flash-flooding, and heavy concentrated flows through private property. Related problems consisted of deterioration of roadways, erosion of ditch banks, and over-loading of the sanitary sewer collection system, causing sewer back-ups into private residence basements. HA partnered with Jerseyville and Illinois DCEO (CDAP and Ike Funds) to assist with preliminary engineering and funding options. A DCEO planning grant was obtained initially, allowing HA to complete a master plan for drainage improvements in the southeast region of the City, including a preliminary engineering report (PER) document. The PER evaluated existing conditions and analyzed feasible drainage system alternatives, recommending infrastructure improvements and related cost estimates, as well as a “staged” construction plan, allowing the City to manage the project in multiple phases and maximize available outside funding. 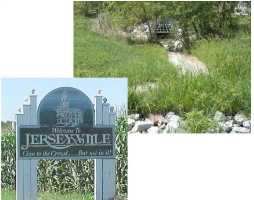 Jerseyville decided to proceed with the project in three major phases, and HA utilized its funding ingenuity to capture over $1.5M of DCEO grant dollars to-date, through the first two project phases, coupled with local City funding. HA designed the first two project phases to alleviate flooding by improving the flow of storm water runoff through and around the project area. A conceptual design has been completed on the third improvement phase, which is awaiting funding for final design and construction. The first two project design/construction phases consisted of 7,100 LF of new 12-inch thru 48-inch culvert/storm sewer pipe, 6-foot by 3-foot box culverts, manholes, inlets, ditch widening/grading, rip-rap lined channel improvements, construction of a new 4-acre storm water detention basin for the entire region, roadway/driveway repair, and incidental utility relocation. The $1.8M combined projects have been a cooperative funding effort among Jerseyville, Illinois DCEO, and HA. The first two project phases have been successful in managing storm water flows in the Curtis/ Adams region of Jerseyville, while utilizing available outside funding resources. The third project phase will be a continuation of this effort.